I'm spending the next month in the Antelope Valley of California, anxiously awaiting the birth of my granddaughter. Since sitting at home staring at my daughter trying to detect signs of labor isn't our idea of a good time, we have been out exploring. Lancaster/Palmdale is in the high desert north and east of LA. Local leadership, whether in community administration or in the business community is serious about capitalizing on renewable resources to power their town. 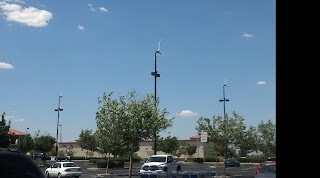 There are small wind generators on the light poles in the Sams Club parking lot. According to what I can find out, these 17 wind turbines are expected to generate 76,000 kWh annually, enough to power approximately 6 homes. 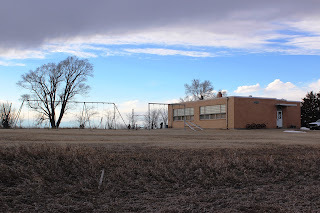 There has been so much controversy lately over Nebraska wind energy and the dismal record we have of capitalizing on this renewable resource, small projects like this might be a way for us to move forward. 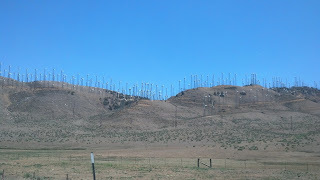 Wind energy doesn't have to mean huge wind farms like these that are seen on the largest wind farm in California in the mountains north and east of Lancaster. These look almost like they sprouted from the mountains, but would be much more disruptive on this scale in the beautiful Nebraska Sandhills (not to say that the stark mountains here aren't beautiful). According to the Nebraska Energy Office, Nebraska ranks 4th in the nation in reliable wind - I think we can all attest to that. 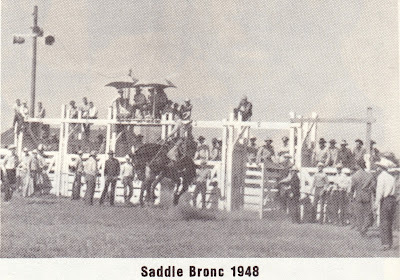 Historically, using the wind to generate power is nothing new for Nebraska. Wind generators were not uncommon before rural electrification. While Nebraska may not have quite as many days of Sunshine as Lancaster, CA. We do average nearly 70% sunny days. Perhaps we could also follow the lead of Lancaster mayor Rex Parris in his goal of "being... the first city that produces more electricity from solar energy than we consume on a daily basis." To that end, local businesses and government facilities erect sun shades to protect cars in parking lots, and those sun shades double as solar panels. Win win situation.